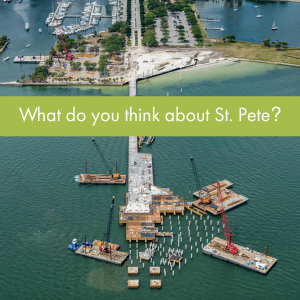 What do you think about St. Pete? We want to know! For a little history, in 2014 the St. Petersburg Area Chamber of Commerce and the City of St. Petersburg came together to create a comprehensive strategic plan for a unified economic development strategy. As part of the strategy a survey was conducted with participation from over 1,500 residents and stakeholders. It provided important perspectives about what it’s like to live, work, learn and experience St. Petersburg. That feedback provided much of the basis for the Grow Smarter Strategy. Now four years later, the Grow Smarter team is putting that survey out to the community again in hopes to find out what has changed, what hasn’t, and how the community feels about the direction of our city, and we hope that you will participate. Please click here to take the survey!